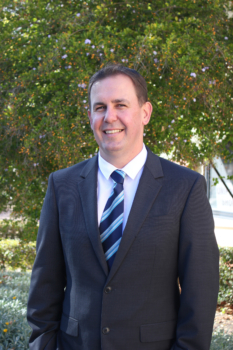 It is hard to believe that my first semester as Principal of Peter Moyes Anglican Community School is drawing to a close. While I have only been Principal of this School for a relatively short period of time, I have found PMACS to be a community of confident and engaging students who make the most of the many opportunities that this school provides. I have been particularly impressed by the high levels of participation in our diverse co-curricular programme, one which provides students with multiple opportunities to shine across the three dimensions of Mind, Body and Spirit. It is a busy time at our School, with the season of Presentation Assemblies well and truly underway. These events celebrate outstanding student achievement and it has been my privilege to present students from all phases of learning with certificates in recognition of their hard work and dedication. I congratulate all award winners for their excellent performances across 2018. Of course not every student has received an award. Rather than being disheartened by this, I encourage students who have missed out on receiving an award to heed the advice of their teachers, seek support as required and strive to reach their full potential in 2019. I recently attended the final meeting for 2018 of the Parents and Friends Association. Behind the scenes and often without the public recognition of what they do, the P & F carry out an immense amount of work on behalf of the School. I would like to thank the long list of parents who volunteer their time through the Parents and Friends Association, so ably led by Mrs Jacqui Buck and her committee. From attending camps, to assisting at carnivals, helping on excursions or providing additional support in our classrooms, your contributions have been significant. Our families are the indispensable and colourfully woven fabric of this Anglican School, the importance of which must never be underestimated nor taken for granted as you contribute so much to making this School the very special place that it is. I am pleased to report that the Parents and Friends Association, in recognition of challenging economic times, has determined that the P & F Levy for 2019 will be reduced to $270.00, with parents still able to claim a Levy Rebate for up to 12 hours of volunteer help within the School. Further details regarding the Levy reduction will be sent to all families in the near future. The money raised by the Levy is used to improve resources available to all students within our School Community. The P&F will be publishing a summary of where the 2018 Levy was used in the 2018 School Year Book. On Tuesday 13th November, the School hosted a meeting for the City of Wanneroo to discuss traffic flow around our school. The meeting was attended by key stakeholders including the Principal of Mindarie Senior College, the Principal of Quinns Baptist College, representatives from Transperth and officials from the City of Wanneroo. Robust discussions were held, with a follow up session likely to be scheduled for early 2019. The City of Wanneroo has taken on board the feedback of key stakeholders and will present a trial proposal for consideration at the next meeting. In the meantime, the School will continue to explore options to assist with the flow of traffic during peak periods. This includes consideration of additional parking bays, clearer signage and collaborating with local schools to develop a consistent approach to traffic management. I will keep the School Community fully informed as things develop in this space. School Council is now starting to turn its attention to the development of the School’s next Strategic Plan, with the current plan concluding at the end of 2019. The new Strategic Plan will guide the direction of the School for the next five years, setting key targets and a solid foundation for all operational decisions. The development of the next plan will be facilitated by Dr. Liz Pattison, an external consultant with over three decades of experience in preparing and implementing strategic objectives. Dr. Pattison will work closely with School Council to formulate the next plan. A central component of the process will be community participation, with key stakeholders including parents, students, staff and the broader community invited to participate. Further details regarding the Strategic Planning process will be sent to all families early next year and I encourage all parents and students to be actively involved in helping to set the future direction of our School. As this is the final edition of the School Newsletter for the year, I would like to wish all School families the compliments of the Season. May all associated with the School be blessed with the company of family, friends and loved ones and take the opportunity to refresh and recharge for what is sure to be a busy 2019. In conclusion, I would like to extend my special thanks to Karen Russell and Stephanie Puttick, for their significant work in preparing and editing the School Newsletter in 2018.